1X, T Put the top card of target opponent's library into his or her graveyard. Repeat this process an additional X times or until you put a creature card into that graveyard, whichever comes first. 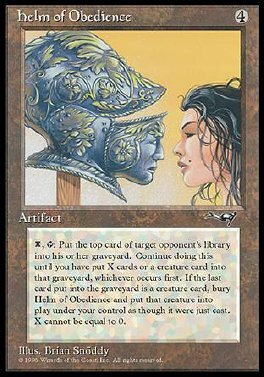 If the last card put into that graveyard this way is a creature card, sacrifice Helm of Obedience and put that card into play under your control.